In my inagural blog post, I talked at length about why I think Sarkisian is not living up to his potential. A tad on the negative side (an understatement). During that tirade, I brought up Sark’s connection and fallout with Norm Chow. Why is this a big deal? Because Chow is a little too well-connected to alienate like that. Maybe he actually eats children in life and just comes off as laid-back and a decent dude to the media. Oh well. What we can look at is his football career, so I’ll get back to doing what I used to do. It’s time for a history lesson. Norm Chow’s body of work up until 2008 was nothing short of insane. His resume includes coaching two-time Super Bowl winner Jim McMahon (BYU), perennial Pro-Bowler and Hall of Famer Steve Young (BYU), current San Diego Chargers quarterback Philip Rivers (NC State) as well as Heisman winners Ty Detmer (BYU), Carson Palmer (USC), and Matt Leinart (USC). This was followed by half a decade of unfortunate circumstances and inconsistency at the quarterback position. His football career started at the University of Utah, where he played offensive guard. It was perhaps his first taste of quarterback instability. He would later return to the Utes an offensive coordinator much later in his career. After a brief stint in the Canadian Football League, he found his way to coaching at a high school in Hawaii. The first career breakthrough he experienced was also his longest stop to date: Brigham Young University. By the end, his title looked like something out of a book of tongue twisters. Assistant head coach/offensive coordinator/quaterback/receivers coach after literally decades of work. However, the 27 years leading up to his departure did not start so prestigiously for him. In 1973, he began as a lowly graduate coaching assistant, eventually working his way up. Under head coach LaVell Edwards, Chow and the BYU Cougars strung together some of BYU’s most legendary seasons, including an NCAA record 14-win season set in 1996 (which has since been tied). The quarterback during that season is one you’re probably familiar with—Steve Sarkisian. Chow and Sark would later reunite at USC. At the turn of the millenium, Chow made a big move that led to a very brief stint at North Carolina State. After spending almost three decades at BYU, he worked for one at NC State—quite the contrast. Notably, he molded freshman Philip Rivers, capping off the season with ACC Rookie of the Year. Chow’s stay was cut short when a paticular former NFL coach came calling. This coach had just been hired at USC and wanted Chow to be their new offensive coordinator. Pete Carroll brought Norm Chow onboard to improve the passing game. It was here that Chow was able to mentor consistent quarterbacks in Palmer and Leinart. Carroll also employed two relative unknowns: Lane Kiffin and Steve Sarkisian. Kiffin and Sark tinkered with the offense that Chow brought from BYU, creating something even greater. 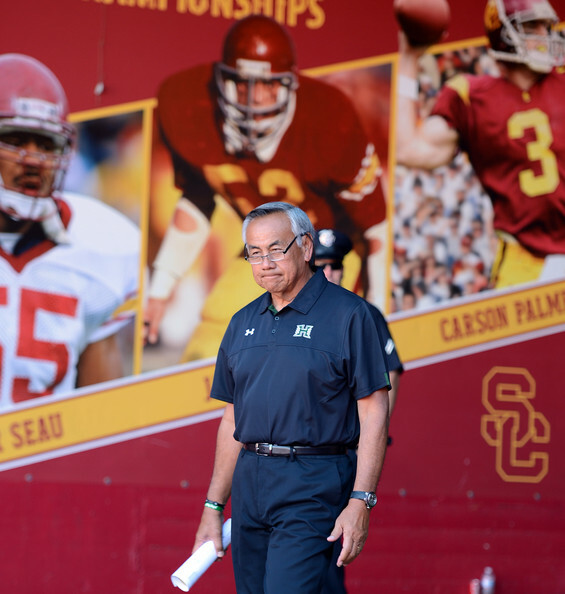 The combination of the three offensive minds Chow, Sarkisian, and Kiffin took USC to untold heights. In the 2004 season, their USC team destroyed Chow’s former employer in LaVell Edwards Stadium. That 2004 run culminated in the greatest beatdown in a BCS National Championship game. That 55-19 win still stands as the largest margin of victory and most points scored by a single team in a BCS title game. After all the glory and fame, the trio would not last much longer. A few weeks later, former USC defensive back Jeff Fisher took Norm Chow to the Tennessee Titans for the same position. As luck with have it, Norm Chow got Texas quarterback, Vince Young, as a top 10 draft pick instead of Matt Leinart. Both these quarterbacks from a supposed “Game of the Century” eventually washed out of the NFL. Chow was fired in 2008, just one season after helping Vince Young win NFL Offensive Rookie of the Year. Luckily, Chow was a hot commodity at that point. His next landing spot was with USC’s crosstown rival, but he would find no solace there. Quarterbacks Richard Brehaut and Kevin Prince were constantly injured or playing inconsistently. Their attempt at installing the pistol offense probably did not help their instability either. His Bruin teams were 0-3 vs. USC, nearly completing a triumvirate of 28-7 losses—they were saved by USC’s infamous 2-minute defense in the 2010, allowing UCLA to score a touchdown in garbage time. Like his time with the Titans, he was fired after just three seasons. Not too much time passed before he received an offer to work under Kyle Whittingham at Utah. Back at his alma mater, Chow was poised to do well. Utah was making their Pac-12 debut. Their starting quarterback, junior Jordan Wynn, had helped lead Utah to consecutive 10-win seasons. On September 10, 2011, Chow and Kiffin faced off against each other in the first ever Pac-12 conference game. The match was a struggle right down to the very end. USC quaterback, Matt Barkley, threw for 264 yards, 1 touchdown and 1 interception while Wynn managed 238 yards, 1 touchdown, 0 interceptions. The score was 17-14, in USC’s favor, with 11 seconds until the end. Utah opted for the field goal, taking the call out of Chow’s hands. The kick ended up being blocked and returned, making the final score 23-14. Two weeks later, Wynn took a season-ending injury to his shoulder against Washington. Utah tripped their way to a 8-5 season, their worst since Whittingham’s first season in 2005. Chow departed to be the head coach of Hawaii shortly after, spending only that lone season at Utah. In what seemed to be an inescapable loop, Chow would face his former coworker Kiffin twice more. The following season opened with rank #1 USC tearing apart an outmatched Hawaii from the very first play. The contest ended 49-10, without really being a contest. They played a few quarterbacks throughout the season. Chow and his Warriors scraped up a 3-9 record, with a point differential of -31 in their losses. The results of the 2013 were even worse. Hawaii fought it out against #24 USC for their first game. The only thing he managed to beat was the betting spread. Kiffin used the game as a sounding board for his quarterbacks and still managed to cruise to a 30-13 victory. The Warriors would only win one game the entire year. For the second straight season, his team finished last in the Mountain West Conference. The patience at Hawaii may be wearing thin. Although Hawaii would be safe from USC on the field in the 2014 season, their storylines found a way to cross yet again. Max Wittek transferred in despite splitting quarterback duties to beat down the team a season ago. He spent the year on the bench because of the NCAA transfer rules. During the offseason, the team respected Wittek enough to elect him as one of the captains. Now Chow and Wittek both have a chance to redeem their reputations. The expectations the two had failed to live up to can be realized in 2015. Wittek can be the consistent quarterback Chow has not had since his days at USC. Hawaii has never really won on the strength of their defense. If they’re going to win, they’re gonna do it in a shootout. If Wittek can score against Mountain West defenses, they can win. I, for one, hope these two Trojans succeed at their new stop. As they say: Trojan for life.